Our faculty, students, and alumni comprise a dynamic intellectual community, engaged in the interdisciplinary exploration of cutting-edge questions of law and policy. Through our signature theory/practice programs, Emory Law effectively integrates students into the profession, while our international initiatives foster partnerships around the world. Emory Law faculty members pursue path-breaking interdisciplinary scholarship across many fields, including law and religion, feminism and legal theory, international and comparative law, and public law and regulation. They develop new ideas and approaches that will have a transformative impact on a changing world. Whether the topic is climate change, mortgage foreclosure, the place of Islam in the secular state, or the challenges of human vulnerability, Emory Law presses the boundaries of learning. Today more than ever, a lawyer’s knowledge must be as broad as it is deep. A further asset of our community is our position as an integral part of one of the world’s leading research universities. Drawing on the strength of the University, Emory Law provides students with unparalleled opportunities for advanced study and joint degrees. Emory Law emphasizes the acquisition of critical thinking skills while offering an array of experiential learning opportunities inside and outside the classroom. Our signature programs integrate theory and practice, bringing students into close contact with both leading scholars and skilled practitioners. The TI:GER program, a unique collaboration with the Georgia Institute of Technology, allows law students to participate in developing and commercializing innovative technologies. The student-edited Emory Bankruptcy Developments Journal connects faculty and students with the bankruptcy bench and bar from across the country. Through the Center for Transactional Law and Practice and the Kessler-Eidson Program for Trial Techniques, Emory Law offers students inventive training in both deal skills and advocacy. Emory Law’s clinical programs, focusing on environmental law, child law, international humanitarian law, and veterans affairs law, provide additional opportunities to gain practice experience while also advancing the public interest. Because of our location in a major urban center, students can choose from an array of challenging externships offering credit for work in government, public interest, or corporate settings. Each of these programs, among others, helps our students seamlessly transition from law school into their legal careers. At the heart of our student-centered focus, is Emory Law’s Center for Professional Development and Career Strategy—which offers a robust approach to help students identify legal fields of interest from the outset of their studies, develop professional success skills, and chart their individual career paths. This fall, first-year students will enroll in an innovative new class entitled Career Strategy and Design. The class is designed to help law students identify their professional strengths, interests, and values; understand the current legal hiring market; and select and implement persuasive themes in their resumes, cover letters, and business communications in ways that enhance their marketability. This creative new course will complement the one-on-one counseling already offered by the Career Center. Legal practice is increasingly global, and Emory Law has a long tradition as a leader in international law. Our outstanding international law faculty work at the forefront of analyzing the place of law in an interconnected world. Through the Emory International Law Review, students participate in the production and dissemination of leading international law scholarship. From Budapest to Singapore, Emory Law students have opportunities to study global developments first hand. Located in a growing international hub, Emory Law also offers its students international practice opportunities through partnerships with the Centers for Disease Control and Prevention, CARE, the Carter Center, and other important global organizations. In all we do, we aim to prepare our students to thrive in the evolving, complex, and global legal environment that surrounds us. About James B. Hughes, Jr.
James B. Hughes, Jr. is interim dean of Emory University School of Law. He teaches courses in property, real estate sales and finance; and professional responsibility. 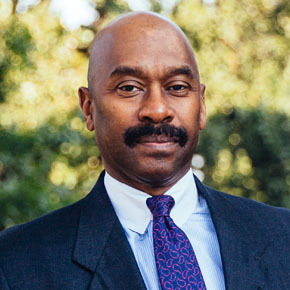 Professor Hughes has been selected as the Most Outstanding Professor by the Emory Student Bar Association (2002) and Professor of the Year by the Black Law Student Association (2005).